Watching Less TV For Health Life. Do you know! Had you thought about it? Sedentary or still time spent watching television/DVDs, is linked to becoming. 2 Do you know! Had you thought about it? Sedentary or still time spent watching television/DVDs, is linked to becoming overweight or obese. 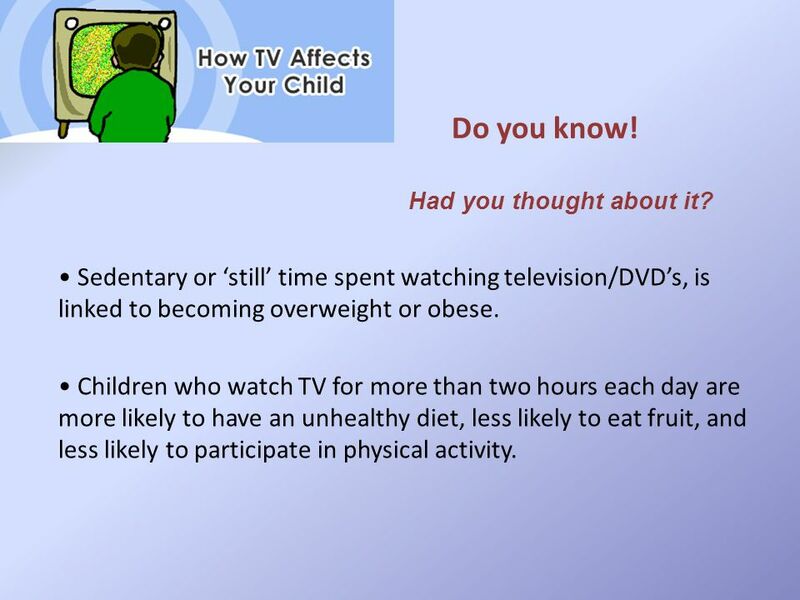 Children who watch TV for more than two hours each day are more likely to have an unhealthy diet, less likely to eat fruit, and less likely to participate in physical activity. 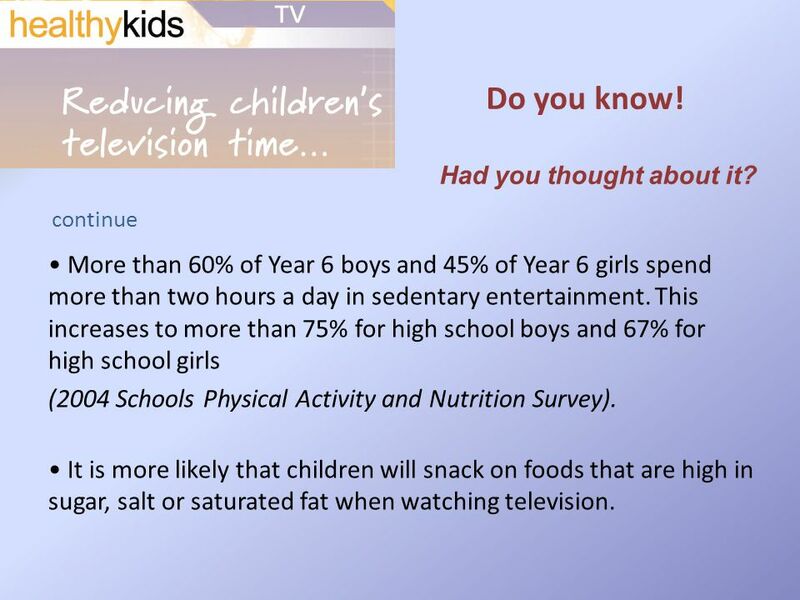 3 More than 60% of Year 6 boys and 45% of Year 6 girls spend more than two hours a day in sedentary entertainment. This increases to more than 75% for high school boys and 67% for high school girls (2004 Schools Physical Activity and Nutrition Survey). It is more likely that children will snack on foods that are high in sugar, salt or saturated fat when watching television. continue Do you know! Had you thought about it? 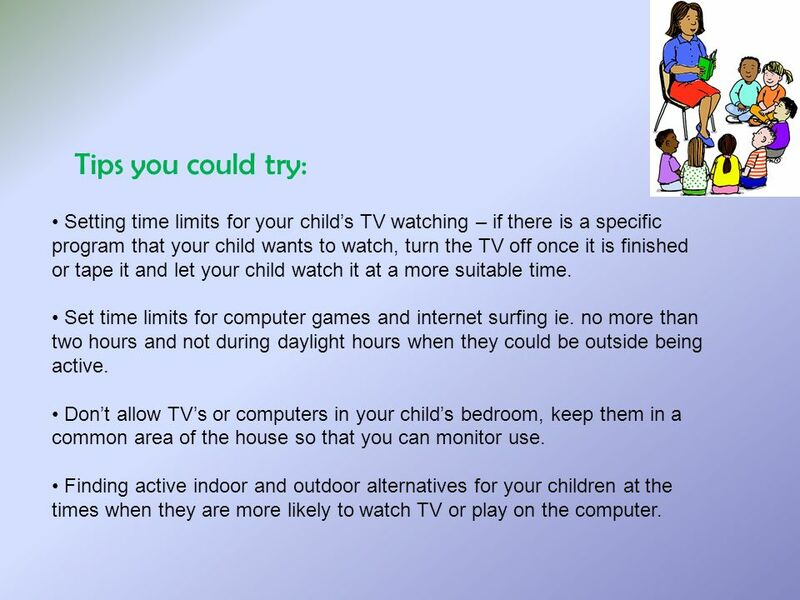 5 Tips you could try: Setting time limits for your childs TV watching – if there is a specific program that your child wants to watch, turn the TV off once it is finished or tape it and let your child watch it at a more suitable time. Set time limits for computer games and internet surfing ie. no more than two hours and not during daylight hours when they could be outside being active. Dont allow TVs or computers in your childs bedroom, keep them in a common area of the house so that you can monitor use. Finding active indoor and outdoor alternatives for your children at the times when they are more likely to watch TV or play on the computer. 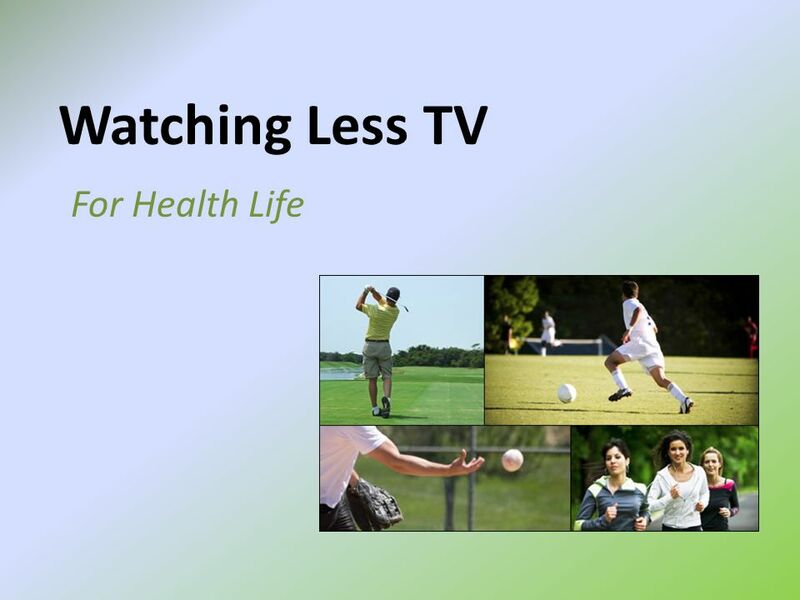 Download ppt "Watching Less TV For Health Life. Do you know! Had you thought about it? Sedentary or still time spent watching television/DVDs, is linked to becoming." ( · ). Looking good, feeling good Unit 3 Welcome to the unit. The Burden of Obesity in North Carolina Screen Time. Child Care Unplugged: What do we do about TV, DVDs and computer games? STARS Training Home-Based Child Care Providers. Rationale for Teaching PDHPE in Primary Schools PDHPE creates an environment where students are encouraged to participate in physical activity. TV and Early Childhood Why we Should Care & What We Can Do. Jeopardy Chapter 16 Growth 7-12 Boys & Girls Health Safety & Hygiene Random Q $100 Q $200 Q $300 Q $400 Q $500 Q $100 Q $200 Q $300 Q $400 Q $500 Final. OBESITY IN CHILDREN YADIRA MISLA. WHAT IS OBESITY? Obesity is an excess proportion of total body fat. A person is considered obese when his or her weight. © 2012 Chevron Healthy Heart Program 10 Tips for Heart Health Presenter’s Name and Title Location and Date. Monitoring Television Viewing Student Created. What does the research say? 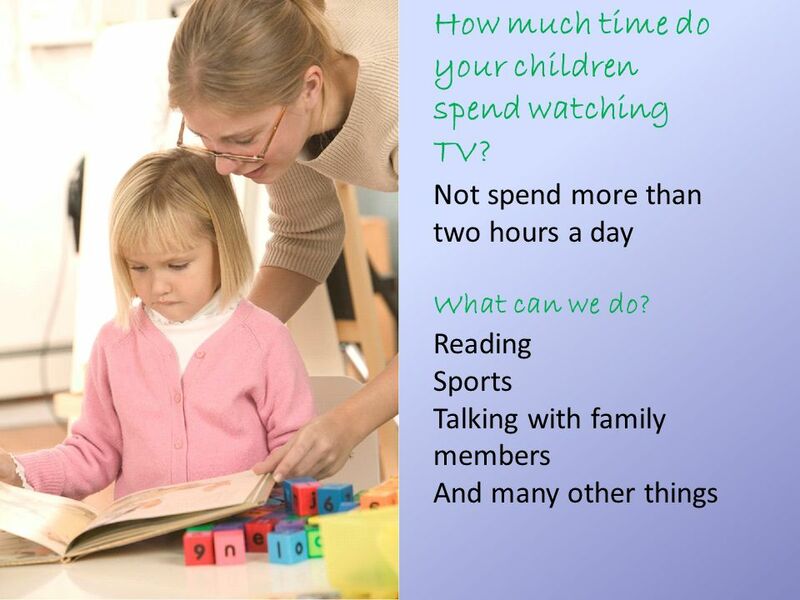 On average children aged 2-11 watch 23 hours of TV per week. Children spend. The Switch Program An Innovative collaboration between Northern Star Council, Boy Scouts of America and the National Institute on Media and the Family. AAA healthy eating 1 Promote healthy eating among elementary school students in Hong Kong Kara Chan Hong Kong Baptist University May 2007. 77g16g 77g 37g How Many Sugar Packets Are in One 20 oz. Bottle of Soda? Or more servings of fruits and vegetables Vary your vegetables and fruits - eating a mix of colors will ensure that you consume a variety of healthy antioxidants! Collège Edmond Rostand MARSEILLE WATCHING TV COMMERCIALS France : 1st week of June.  To see if there is any correlation between the childhood obesity epidemic, and the roles that television advertisements play on influencing food choices. Healthy Eating Questionnaire By Year 2 Children (6 and 7 year olds) Glory Farm School, Bicester, UK. QUESTIONNAIRE France : Total number of pupils: 30Age: 13 Total number of girls: 14France Total number of boys: 16.